PLEASE BE ADVISED: We are taking reservations for the months of May and June. Please call (313) 291-2780 and leave your name and telephone number for a call back. Please check our Facebook page for any updates, weather problems that may have caused classes cancelled for the day or rescheduling. ATTENTION: K9ATF is NOW requiring all dogs to have the influenza vaccine in order to take a class or enter the Facility. Make sure the vaccine is covering both strains of the flu which are H3N2 and H3N8. This is an added requirement to the traditional vaccines. 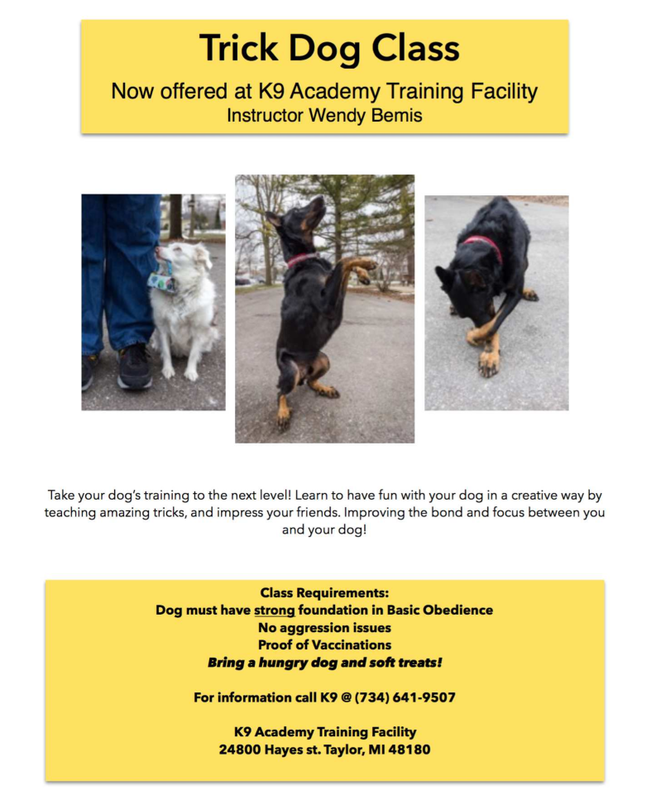 A four week class that introduces off-leash work, team coordination and advanced commands while enhancing the basic skills learned previously. This class requires the completion of the Basic Class mentioned above. We have a new look to our page! You can submit your paperwork in the accustomed system through the “Officer Login” button on the top right. Upcoming event dates will be listed here. Check the Classes page for regular hours.